Although still in pre-production, Gigabyte’s newest mini PC debuted at CES, packing a lot of hardware into a tiny chassis. At 0.3 liters (or 10 fluid ounces) and 4” x 4” across, it’s a bit reminiscent of the Genie from Aladdin: “Phenomenal cosmic powers… itty bitty living space!” For purposes of comparison, the much-beloved Mac Mini measures 7.7 inches square, almost twice the size. 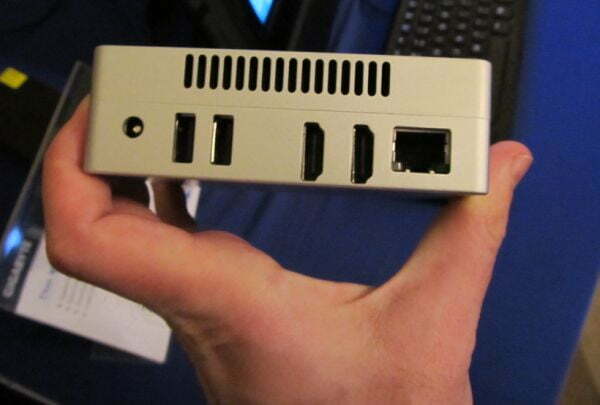 The unnamed Gigabyte model builds upon the Intel NUC, a mini-PC platform developed by Intel, but adds several compelling perks. Most notably, there’s now support for i3, i5, or i7 Intel Core processors, as well as USB 3.0 ports. Up to 8GB of RAM and up to a 256 GB SSD provide the finishing touches for a rather robust system. Additionally, the teacup-sized desktop boasts a brushed-aluminum body and low-power design, making it a green product—and therefore potentially attractive to LEED-certified buildings and businesses looking to round out their environmental credentials. Although Gigabyte has yet to set a pricetag, they have hinted that the entry-level model should be competitively priced, according to Liliputing. Hands on: HP's ElitePad 900 tablet easily outshines the TouchPad, except on price!